Where Should We Put the “Downtown Relief” Line? The Downtown Relief Line has been in the news a lot lately, what with dreams of vast new revenues to pay for transit expansion and, at long last, a recognition that more people want to travel downtown than we have transit capacity to handle. Back in the 1980s, the Network 2011 plan included a line from Union Station to Don Mills and Eglinton by way of the rail corridor, Eastern Avenue, Pape, a bridge across the Don Valley, and Don Mills Road. This scheme was turned down in favour of the Sheppard Subway as part of a misguided idea that if we simply stopped building new lines into downtown, growth would stop. In fact, GO Transit did a fine job of providing extra capacity, and more recently the new downtown condos have raised short commutes by streetcar, cycling and foot to levels nobody expected thirty years ago. The Yonge subway filled up, for a time,but the pressure fell off thanks to the 1990s recession and the general drop in transit use. That’s no longer the case, and suddenly everyone wants to “do something” about transit capacity downtown. The TTC, shamefully, downplayed anything beyond its own mad scheme to stuff thousands more riders onto the Yonge line, a project requiring major changes in signalling, reconstruction of Bloor-Yonge station (and possibly others) for extra capacity, a much larger subway fleet (and yards to hold it) and possibly even the addition of platform doors at all stations. Council asked the TTC to look at a DRL, and there is even supposed to be a study. However, its web page is the only sign that anything is going on. Meanwhile, every would-be transit planner in town is busy drawing maps, to the point where a credible plan can be found simply by dropping a piece of spaghetti on a map of the city and declaring this a route. (Post-graduate degrees are available to those who can determine the ideal height from which to drop the pasta and cooking time needed to produce the best results.) What’s missing in a lot of this discussion is a view of how a DRL might fit into a wider network, not to mention a few basics about how a new rapid transit line will, or will not, fit in some of the proposed alignments. One of the better proposals is on Phil Orr’s DRL Now site. It’s not perfect (no proposal is, including those I have floated from time to time), but at least this is a place to start with sufficient detail to understand what is going on. Drawing a swoosh across a map is easy (politicians do it all the time), but designing something that might actually work is a lot harder. A major challenge with some versions of this line is that proponents try to do too much. Playing “connect the dots” with a transit route has its limitations, and trying to hit too many of them causes the line to wander out of its way. This ties back to a fundamental question: what is a DRL supposed to do? If we believe some of the simpler plans (notably one in last week’s Star proposed by Councillor Pasternak), the DRL’s sole function is to get people from the Danforth subway to Union Station. This is far too simplistic and guarantees the line will not be well used except as a peak period relief valve. Other schemes take the route south of the rail corridor to serve the Port Lands and eastern waterfront. Aside from the problems of building such a line in landfill beside Lake Ontario, the route would not provide the fine-grained transit access possible with a surface LRT, and would vastly overservice an area whose expected demand is lower than the existing Sheppard subway. Connection to Union Station from the south would also be a big challenge. A”DRL” should not exist solely to relieve the Yonge line’s peak traffic problem, but should provide new links within the transit network giving rapid transit to areas of the city that do not have it today. Indeed, the regional function within the network may well be as important as the “relief” function at Bloor-Yonge. Any proposed route through downtown must respect the actual built form of the streets and buildings. Diagonal routes through built-up areas should be avoided as they are difficult if not impossible to build. Stations must be located where it is physically possible to build them. Some routes use rail corridors without considering how either a surface or underground station might fit or be built. A “DRL” is not the complete solution to capacity problems on the subway. These problems originate north of Steeles Avenue, and a major role in trimming peak demand falls to GO Transit which has several north-south routes that could drain traffic otherwise headed for the Yonge line. I have concerns with a few details of this plan, but the basics are good. Another view of the route is available via Google Maps. This has the advantage of showing the detailed alignment rather than a “route map” graphic. Over the years, I’ve taken a lot of flak about LRT proposals for Toronto. Some folks imply that I am personally responsible for leading one or more generations of politicians astray, and that LRT is an invention of my very own with which, like the Pied Piper, I have lured the city away from its true destiny, a network of subways and expressways. That is an exaggeration, but there are times I wonder at the powers claimed for me, and wish I had taken up a career as a paid lobbyist. 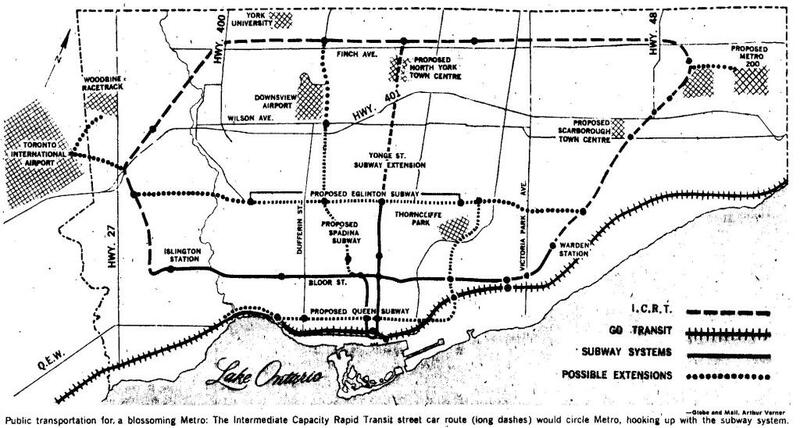 In fact, there was a time when the TTC was considering a suburban LRT network of its own, one that bears some resemblance to plans we are still discussing today, four decades later. To set the stage, here is an article from the Globe and Mail of September 18, 1969 about the new life Toronto’s streetcars would find in Scarborough. Included with the article was a photo of a train of PCCs on Bloor Street at High Park, and a map of the proposed network. The TTC’s hopes for streetcars on their own right-of-way are a bit optimistic, and it’s intriguing how the ranges seen as appropriate for various modes have all drifted down over the years. All the same, it was clear that the TTC had an LRT network in mind and was looking eventually for new cars for that suburban network. It didn’t happen, of course, because Queen’s Park intervened with its ill-fated high-tech transit scheme. A few things on the map are worth noting. North York and Scarborough Town Centres are still “proposed” as is the Zoo. There is a proposed Eglinton subway from roughly Black Creek to Don Mills, and the proposed Queen Street subway turns north to link with the Eglinton line and serve Thorncliffe Park. The network includes links to the airport from both the Eglinton and Finch routes. I didn’t invent this plan, and Streetcars for Toronto was still three years in the future. Somehow, the TTC and Toronto lost their way, and what might have been the start of a suburban transit network, years before the development we now live with, simply never happened.